After a lot of searching and planning I've finally found the BEST of the BEST in winter jackets! I've been dying to gather together a great selection of what's on offer for a curvy figure. So a few weeks back I got together with my friend Michael Alesich and shot my top 3 jacket choices for a Melbourne Winter. This year I've given into colour and tried extra hard to not buy everything in black. I have a full wardrobe of colour so these days I've opted for bright shades, pale shades and prints. Starting first with my safe colour - brilliant, bright red! 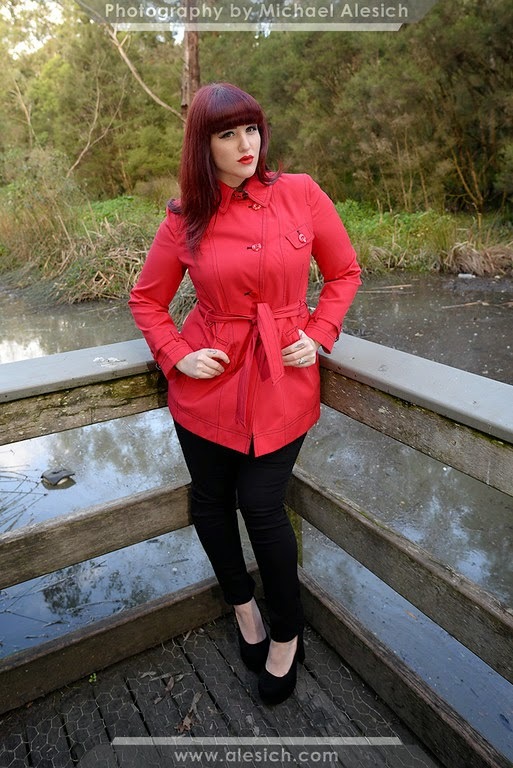 This shorter style mac from Simply Be is a bold red that will pair wonderfully with many other colours you might have in your wardrobe. With a contrasting black stitch this coat is a classic shape yet much shorter than usual. The bright red fabric is lightweight but still keeps you warm enough in the winter months. I'm wearing this in a size 16 and it's form fitting but has just enough room to wear a layer or two beneath. The buttons fit wonderfully over my large chest which is wonderful. With a 34GG chest it's hard to find button ups that fit without popping! You can also wear this jacket open for a more relaxed and casual look. I paired both of these shorter style jackets with the Chloe Super Stretch Skinnies. These jeans are exactly like their name and are very, very stretchy. I'm wearing these in a size 16UK and I will definitely need a size down as they are loose by the end of a days wear. Otherwise they are a perfect mid waist pair of jeans, they don't give you any bulges and sit perfectly under all tops. Next on my list will be the Dark Indigo and the Mid Blue shades, I tend to wear more blue jeans in the warmer months. You may remember this stunning jacket from one of my previous lust lists. The moment I saw this jacket I knew it must be in my life! Gingham is my weakness and the mixture of the traditional trench with a pinup print is in one word - PERFECTION! Every details is beautifully tailored the traditional fit and feel of this garment make it my all time favourite jacket. I'm wearing the Gingham's Up trench in an XL and the fit is spot on. With room to wiggle and layer, the ability to button up or button down and the soft and silky lining this is a dream to wear. While the shape does not mold naturally to my curves the waist tie nips me in perfectly. The pattern is bold and stunning and you'll fall head over heels with it I promise. This style will also work wonderfully in spring as it's not an overly heavy fabric but still a warm fabric. If I could have this style in other colours I'd never but any other style coat again. Lastly we have a shade that until the last year I've never considered really to be 'my colour'. Through reviewing and shooting my baby blue and pale pink Dita Cardigans I realized that my pale skin and dark red hair works really with with this colours. So when I saw this perfectly pink Biker Jacket in faux leather I though it's time to be brave and get a biker that's not black! I think I made the right choice as it's an awesomely unique jacket and so soft and comfortable. The faux leather is soft, silky and unexpectedly stretchy. I'm wearing the 14UK and I've got heaps of room to move and layer beneath. I just adore how it pairs with all of my black jeans, dresses and accessories and how it pops. If you are looking for a new and super funky biker/moto jacket I highly recommend this one. But be sure to size down as these are a very generous fit. The hard part now is choosing which one to wear each day! Many thanks to Michael Alesich for shooting these winter warmers with me, I can't wait to shoot with you again! It’s appropriate time to make some plans for the future and it is time to be happy.All-weather parkas and puffer jackets are best suited for inclement weather. ... Sweaters are essential layers for keeping warm this winter.